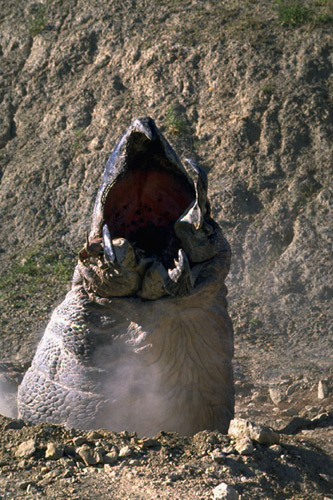 The Graboid is one of the most memorable Monsters from the genre’s long-lived history, and has visually accompanied my blog since the beginning. Monster Legacy was first created on July the 27th, 2011, on a Blogspot address. Technical issues with the server have convinced the writer you are reading from to try a new place to work on. I chose WordPress, as it was suggested many times as a tidier and smoother server — and it is here that, from now on, that I will post my articles. With that estabilished, what is this blog about? Monsters. Monsters, or fictional creatures, have always been part of our history: terrifying inhabitants of our legends and fears, they have been featured in a ginormously wide array of fictional works. Monster Legacy focuses, in particular, on their presence in motion pictures and novels — without excluding eventual essays of purely folkloristic subjects. Generally, the articles regarding Movie Monsters focus on the process of their creation and presentation. From script, to conceptual designs, to practical and/or digital realization. Other than that, the blog will continue to report news about upcoming films of the genre. The blog is currently under construction — I am transferring the data from the old address to here. As I always say, stay tuned. Posted on 03/03/2013, in Monster Legacy and tagged Monster Legacy. Bookmark the permalink. Leave a comment.